long hunts as a staple. - Coffee continues to be one of Ethiopia's major crops. - Ethiopia is one of the oldest countries in the world. 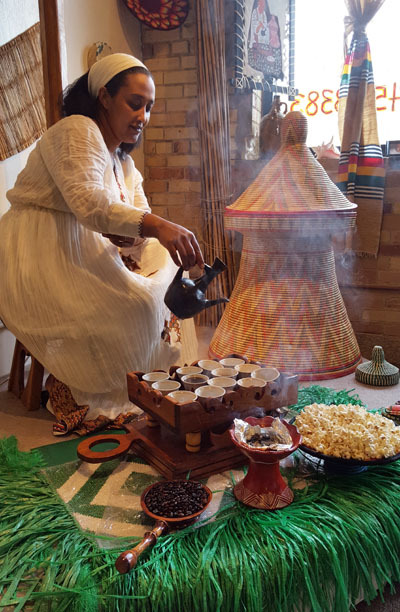 In Ethiopia, the coffee ceremony is a daily tradition among many families and is often offered when visitors arrive. During the coffee ceremony, green coffee beans are roasted over a fire and then ground by hand. The beans are then placed in a traditional ceramic pot and boiled with water. Once the coffee is ready, it is poured into coffee cups that have been arranged on a wooden tray. The coffee beans may be boiled as many as three times. Often the coffee ceremony includes the burning of incense during the process. If you would like to observe this tradition of roasting coffee beans, please call ahead to let us know. 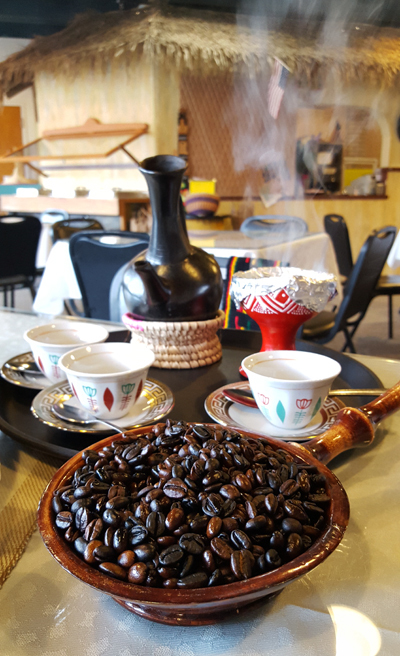 We will perform a coffee ceremony as you wait for your meal. Otherwise, come enjoy the deliciously rich Ethiopian coffee we serve everyday. Designed by Designs on the Grand >> Copyright 2016 by GoJo Ethiopian Cuisine.